Momma Told Me: Shoes are the vehicle for memories yet to be made! As a child I despised the task of shopping for footwear. My readers already know of my lifelong battle against my feet, and their early developing shoe size. Much like Sabrina (10), I was wearing adult sizes, and stealing Momma's shoes long before I'd left elementary. As a girl who developed into size 11.5 feet I quite literally dreaded the task of shopping for 'formal' shoes for high school dances, and opted to wear flip flops to my Senior prom. I can recall many occasions in my teenage years where I was found slumped, defeated, over a fitting island in a high end shoe store. Whatever the occasion, it would ultimately end the same; myself exclaiming in exasperation "Why can't I just go barefoot?!" Momma who, looking back, seemed to have the patience of a saint, would very calmly sit down beside me and remark that "Without shoes, there is nowhere to go!" Of course, in a literal sense, that was not entirely true, but figuratively, she was right. Dances had a mandate for footwear, I could hardly walk the Summer pavement more than 2 feet without a proper sole, and I couldn't even walk into a McDonald's and grab a bite without shoes! Lucky for me, with the exception of rare formal occasions, Momma was generous in her definition of 'everyday footwear' and encouraged a blossoming appreciation for sandals (more affectionately called flip flops). I quickly learned that this marvelous genre of shoes allowed much more freedom in fit than close toed counterparts, and were often affordable enough for me to collect multiple pairs for styling and expression. Of course I realize that not all of my readers can be as lucky as I am to live in a climate that permits such footwear year-round, but I am so very grateful that I am. Raised and rooted in sunny Southern California, our home just minutes from the shore, I could (and admittedly do) live in my sandals. No matter where you live, any woman can acknowledge the invaluable worth of a beloved pair of flip flops. Whether you're waiting for a pedi to dry, or looking for something to slip on after a day in heels, the right pair of sandals can ease our souls and inspire adventure. Just like Momma Told Me, my footwear is the vehicle I use to get to, and through, many of my life's biggest adventures. If my shoes could tell a story, they'd have thousands; one for every day I've walked in them. In the 4th Grade, Sabrina has very a very strict footwear policy at school and often comes home complaining of how stiff or sore her feet are. She's a wild child at heart, and hates to be tied down to the monotonous task of socks and lace tying. If I had a dollar for every almost heart attack I've had watching that child walk with intentionally untied laces, I'd be living in a bigger house! During the weekends we all pull out our flip flops and try to hit the local sights for some exploration and appreciation of the beautiful palm tree lined harbors. There are a lot of independent surf shops and boutiques down by the harbor, so you can imagine my surprise to discover my new favorite footwear vendor was a Sport Chalet in town. It should come as no surprise that their footwear selection contained a vast array of active-wear shoes, including hundreds of styles of.....drum roll please.....flip flops! Even sporty in nature, a great pair of designer sandals is worth it's weight in gold. I'd decided instantly that we were all due for a new pair of shoes, and let Jeremy and Sabrina enjoy their hunt. We looked at a lot of familiar brands, but were most intrigued by a name that was new to us. Reef specializes in lifestyle apparel geared towards individuals who love to get outdoors and enjoy casual activities like surfing and sandcastle making. Their collection of apparel and accessories covers casual close-toed footwear, flip flops, wetsuits, beanies and more. Considered more of a culture than clothing line, the brand is at once trendy and casual, with designs to suit the entire family. We consider ourselves casual consumers, and were immediately drawn to the range of printed straps, and lush textured foot beds. Jeremy was at once in awe of the craftsmanship found in their J-Bay Collection with it's beautiful leather footbed and pigskin lining. Even I was swooning at these masculine shoes, and had to promise their appearance as a birthday gift later this year, to force them out of his hands. Sabrina and I were equally torn between the beautiful Bohemian inspired woven rainbow Gautamalan Love Style, or the more mainstream Stargazer prints. In the end, we favored the plush footbed and arch support of the fashions with animal print, and both opted for Zebra strapped flip flops. No sooner had we left the store then I was asked if I had scissors (to cut the tags so Sabrina could don her new shoes). And the three of us had hardly settled in the car when a suggestion was thrown out to make a day of the excursion and hit the marina. 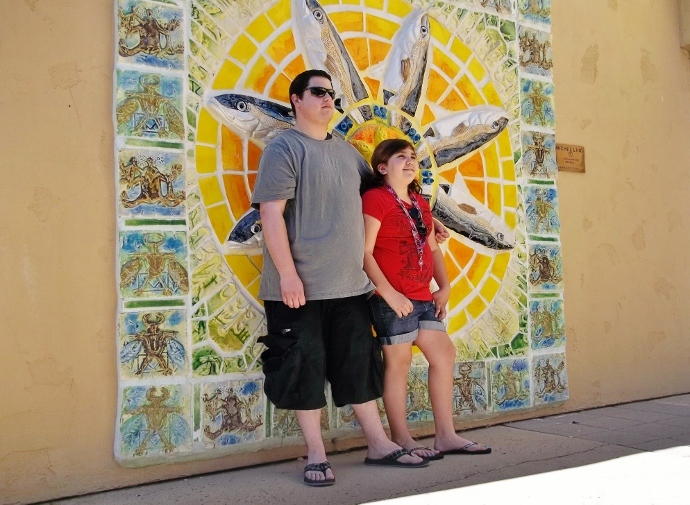 With Reef afoot, we journeyed to the local harbor, where we enjoyed the sights of local mosaic murals, inbound fisherman's vessels, and tourists on paddle boats. Playing photographer I chronicled the day which included exploration with over-sized binoculars, snapshots of human heads on cartoon bodies, and a hand scooped cone on the Boardwalk. Somehow I managed to avert hours spend on the DDR game in the arcade, though I didn't quite make it out of the boutiques with my wallet in tact. Shortly after lunch we wandered down the the local park, which also happens to be right on the beach, and lounged around in the grass. I was about to remark how impressed I was with the comfort of my feet after all the walking we had done that day when a hyper 10 year-old drug us off towards the sandy dunes. Jeremy had requested a gratuitous Facebook photo of him sitting on a dune staring out into the ocean, so I picked up my camera once more. No sooner had I snapped my first shot then I looked to my Left to discover the above; Sabrina buried waist down in sand! It seemed like we'd never make it to those rolling waves, sliding our shoes off to make the remainder of the trek in sinking sand. 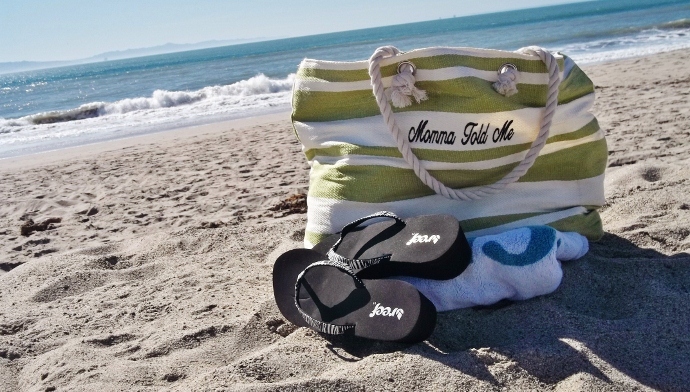 Just another benefit of wearing flip flops, complete versatility- they're even light to carry, and slim to stash in my beach tote! Everyone seemed quite excited to see the tide rolling in; after all, it was a very warm, even hot, day. Poor Sabrina was in for a surprise though, no sooner had she slipped her shoes back on to walk on the 'hard sand,' than a wave came rumbling in and soaked her feet. Apparently it was cold, because she promptly jumped backward and let out a shriek. Thankfully, her footwear was water resistant. Once feet got wet, it was all over; a second tide came rolling in and soaked us 2 feet up. Moments later a sand crab was discovered and the 10 year-old ran along the shore with her shoes making odd clapping noises along the soles of her wet feet. It's days like these that I suppose I'll remember for a lifetime. Days without a plan, faced with the sincerest enthusiasm for ordinary adventure and unexpected memories. And not one of those memories could have been collected without my faithful flip flops. At the end of the day, caked in dried sand and mud, they met a quick rinse down with the hose, and were lovingly sat back by the front door, awaiting tomorrow's unexpected journeys. As a wise man once exclaimed "Oh, the places you'll go!" Do you have a favorite memory tied to a pair of shoes? Are you as passionate about freedom in flip flops as I? Get a behind the scenes sneak peek at this season's footwear trends in our Flip Flops Google+ shopping album. 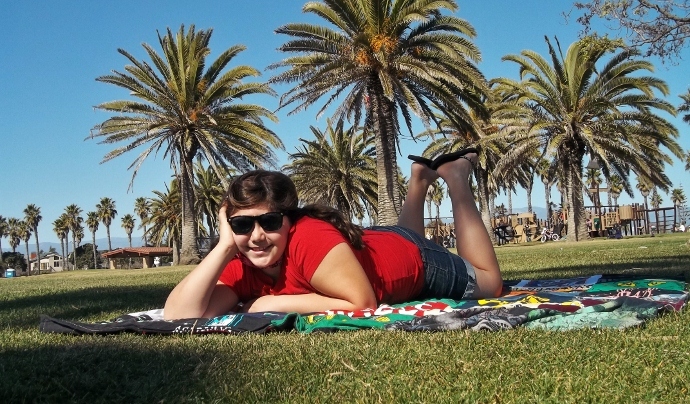 What Daughter Says: I'm a Southern California girl who loves to 'drive' to her memories in a favorite pair of flip flops! I love love LOVE your flip flops! I love them! I'm crazy about my flip flops in the summer! I usually have about 3-5 pairs each summer. I like to have a pair for each different type of outfit. They are outstandingly comfortable in the warmer months. How fun! Love the pictures...I'm a huge fan of flip flops, especially if I can find a comfy pair! It's also awesome because since the SO, my dad, and I have the same sized feet, we can just slip on each other's and head out...lol, I just imagined them wearing girly sandals but that doesn't happen. I usually wear more unisex style sandals. Oh, I love these flip flops! I wear flip flops 24/7 in the summer!!! They are so comfortable! You know... I have always seen Reef around but never paid any attention till now. They look so comfy! love those flip flops and enjoyed your post! I must have those black and silver sparkle zebra print flip flops. How great would my feet look in those at the beach???? I love Reef brand flip flops. Your daughters toes are super cute. What color is that polish? Great photos, as always. I wish I were at the beach right now. I love wearing flip flops! These look really comfy, too! I love flip-flops! Love the J-Bay and I see that they make a similar one for women called the Skinny Leather sandal. I think I'm going to order a pair! Thanks for the link! I wear sandals year round as I love the ability to slip them off quickly as I hate wearing shoes. However I have never found flip flops to be that comfortable because of the post between my toes. Looking at all the neat styles has convinced me that I should give them a chance again. I'm a big flip flop fan as well...and these are adorable! Makes me anxious for beach weather!! I am a flip flop junkie. I can't live without the in the summer time. These are soo cute too! LOVE! I am from southeast Texas--my son and his family live in Galveston--flip flops are year round footwear! I miss wearing flip flops all year. Those are some adorable flip-flops. I am not a big fan of flip-flops but I would buy these. Thanks for the review and the pictures are awesome. I love your flip flops. I love Reef flip flops because they actually have some support compared to most flip flops. they are worth every penny. Sounds like you had a great day! These flops look so comfortable! The ones you had with glittery zebra stripes were also totally fabulous! love! I love these flip flops. Great photos. you had me at zebra glitter! wow,these look awesome! they look really well made which is nice in a flip flop. i had a bummer of a pair last summer that completely fell apart as i was walking.fun! might need some of these! My husband is obsessed with his Reef sandals! He loves them more than any pair he has ever had, I think I will check into getting a pair of my own this summer! I wear flip flops all summer and usually just get the cheap ones at Old Navy, I would love to try some different styles and brands. These look comfortable. Would love to try a pair! My daughter loves them! These look so comfortable and they make me want summer so bad! Reef is a great name in footwear! Your pictures make me yearn for Summer as the snow falls outdoors. I love flip flops all the time. I have big feet, size 10, so I understand your point on that. I love the look of those flip flops and they look really comfy also! Gosh, if I lived anywhere near the beach (especially southern California), I would be in flip-flops 24/7 (unless sleeping). I love the weather and the sun! Your flip-flops are pretty, by the way! Gotta love glitter! I love that this feels like a culture and not just a product. Such a wonderful review and great pix ...feels like I joined you all! I love flip flops in the summer, the go to shoe for me also. You gave a very thorough review. Thank you. i'm in northern california and wear flip flops so much! i love the black sparkly ones-very cute & stylish! These flip flop look very stylish while being comfortable...score! i love them! and it really looks like they will stand the test of time! These are cute. I like that they aren't flimsy. Good flip flops are hard to find. The Reef flip flops look supercute. Two of my favorite pairs of shoes ever were flip flops - currently a pair of yoga flip flops that have dividers between each toe. It's much more comfy than it sounds! 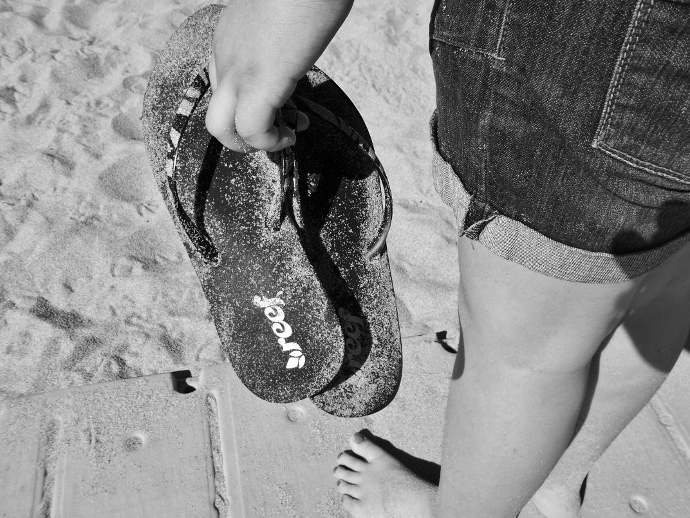 Flip flops are the best on the beach! 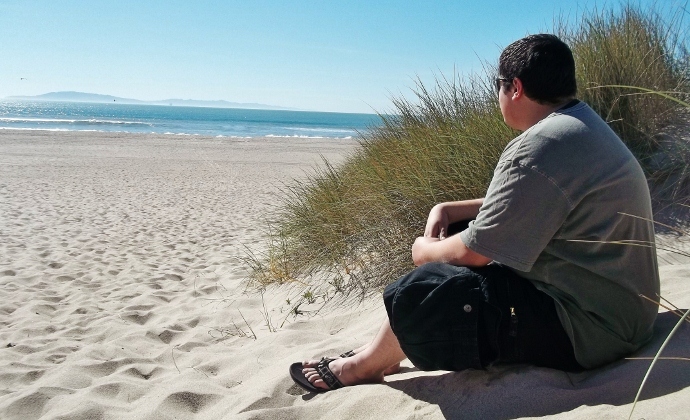 I have a lot of memories of going to the beach with my fam and running out in flip flops. I too am a ALL SEASON flip-flop wearer, and luckily, I am also very fortunate to live in beautiful Southern California!! Great flip-flops! I tend not to be quite so passionate as flip-flops, but I definitely err on the side of cozy with shoes. There are these slip-on tennis shoes I used to love as a child, and I just tracked them down last summer for a month-long solo Amtrak trip across the USA. They were my constant companions, but got an unfortunate hole in the toe whilst spelunking in Arizona. I was just able to find another identical replacement pair, and they are with me on my latest adventure. Your flip-flops are super cute, I love the sparkles! I checked out the Reef site (it doesn't take much to convince me to shop for shoes...) and I LOVE the Creamy Leather Reef sandals!!! I love flip flops! And now I want to be at the beach! We're going to FL in June so I can't wait. So I need some of these. Living in Florida, we're a flip-flop lovin' family too. 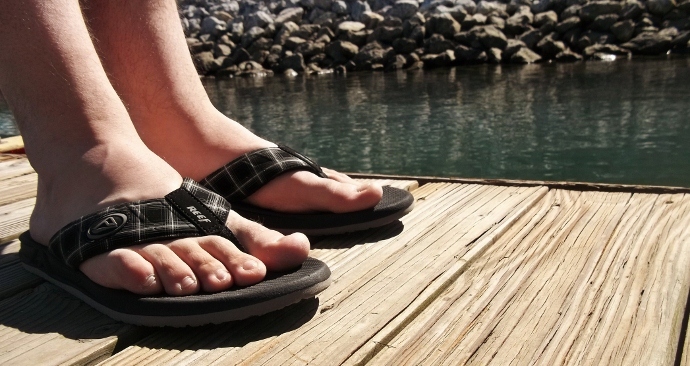 Me, my son, dil, & the grands all wear flip-flops, everyone except hubby who wears dock siders and never any socks. We can't live without them and these looks so comfy!! These look cute, comfy and practical for a casual lifestyle. Gotta love flip flops! We are from Southeast Texas and we wear flip flops just about all year round. these would be a must for my daughter...we are in California so we wear flip flops from march until September....looks like you all had a fun day! I live in flip flops all summer, and these look so comfy. Love the blue polish! I love flip flops... wear them as long as I can throughout the year, though I wished I lived in a climate where I can wear them year round. These look super comfy too! I pretty much live in flip flops in the summer time if I'm not at work and have always said I need to get a pair of Reefs because I had heard such good things about them, but alas I never had! Your post is making me put it on my to do list before summertime!!!!! What a great post. The pictures are nice. The fip flops look comfy, I wear them a lot during the summer months. Thanks for sharing this. I usually don't wear flip-flops but I would wear these. They look so cute and stylish. I really like your flip flops, they look comfortable and stylish. Flip flops are a year round thing for me. I have been wearing the same pair of reefs for about 10 years and I love them. If my cat hadn't chewed one of them a little, I wouldn't be considering replacing them. I LOVE them. I love this review of Reef, I have never owned a pair but would like to. LOL about your large feet, I am 46 and wear a size 11 and those sizes were so hard to get when I was growing up that many times I had to shop the mens shoe section.